A poor sleep, nothing to do with the moment and everything to do with being in a cycle of poor sleep, showed that all my little roof blocked was the very bright moon as it crossed the sky and then the view of the stars. A few clouds played, but mostly it was clear. Home seems to like to cloud up and rain at night, but these mountains like a good afternoon clamber with clearing at night. Still, the late evening activity hinted that there might be a little more to the current weather than just what the mountains generate. Morning is clear and George is shaded by the mountains with plenty of fish jumping. George Lake and a pothole beside it sit in shadows reflecting a morning sky. The trail along the side of the lake has a tree, still green, fallen across where it is difficult to get past, but from here the map considers this maintained trail again. Below the lake, there are lush meadows full of wildflowers in at many distinct colors. 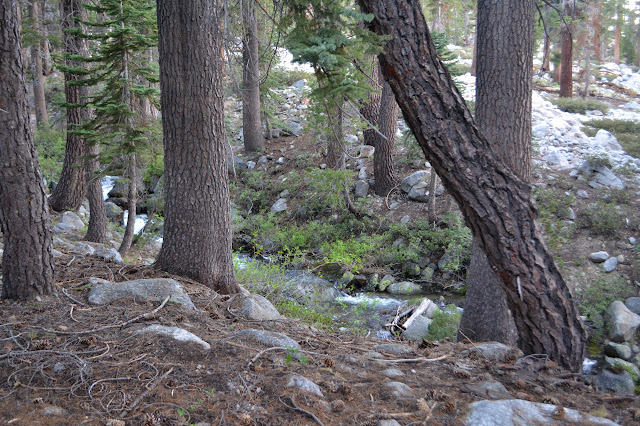 After a boulder filled creek crossing, it descends gently through trees. After a second crossing on a bridge, it gets a little steeper before dropping over the side and really getting into losing elevation quickly. 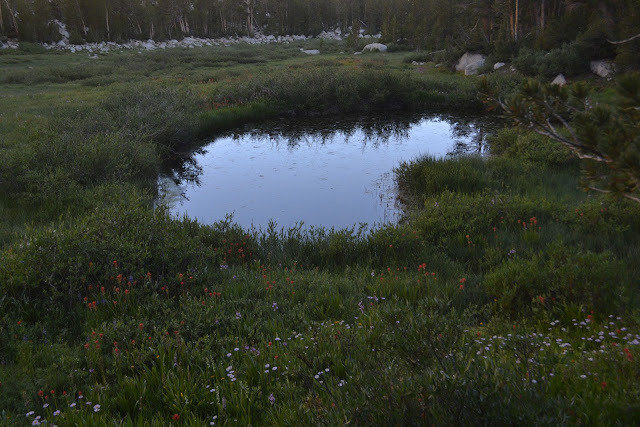 A mosquito breeding ground among the grasses and flowers. The south end of Lake Sabrina comes into view. The creek coming in seems to contain a rather large waterfall. 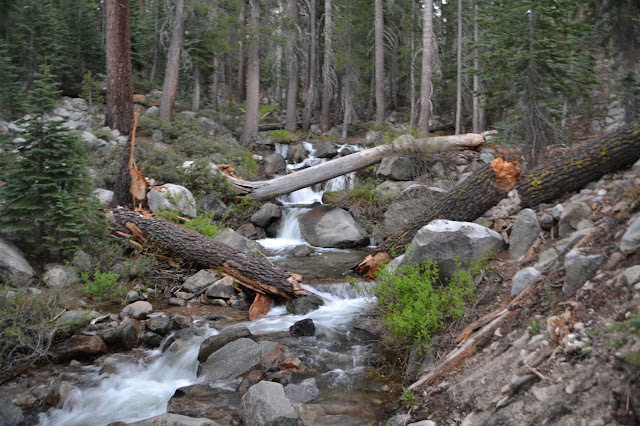 Some thinner falls could be seen around the area. 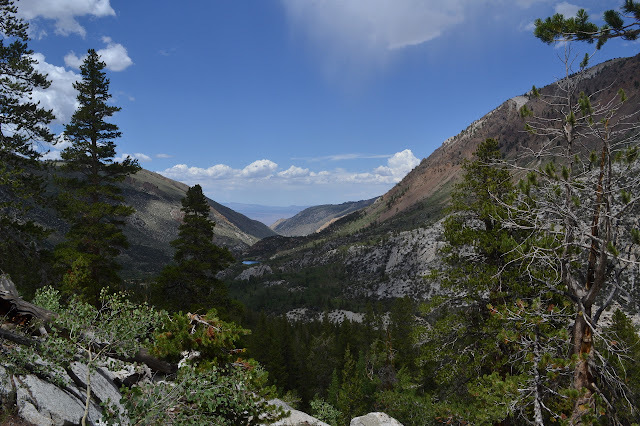 In planning the loop through Evolution Basin, a location commonly claimed to be a favorite along the Pacific Crest Trail through the Sierra Nevada Mountains, most will get a shuttle or plan to hitchhike between the North Lake and South Lake. Not me. I planned to connect the two by the Tyee Lakes Trail and the George Lake Trail and the short up and over seems like a good start day for the trip. It needs to be short because there is also the matter of the long drive up and grabbing a permit on the way. 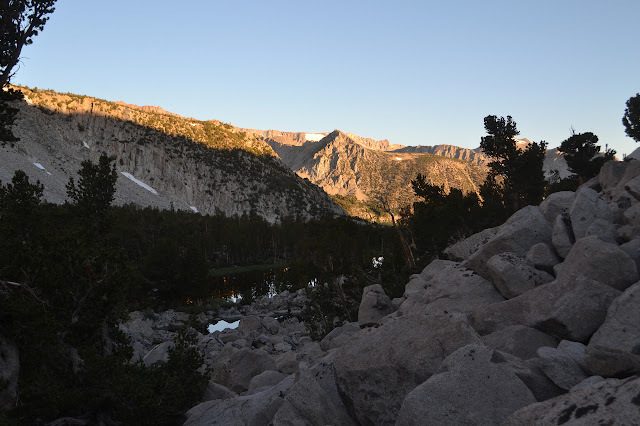 This year, walk-in permits are being released at 11 AM the day before, but they are still free for Inyo National Forest. Arriving at the Interagency Visitor Center a mere 23.5 hours after the day's permits were released, I easily got one of the 10 total, 6 that may be reserved, that are offered. This is also a nice trail to start at since it is the only one in the area where a backpacker can actually park next to the trailhead. South Fork Bishop Creek roars under the bridge as I start and quickly stop again realizing I have not eaten anything since an early breakfast. Food will be required to get up this hill. But the view is nice. Looking up the canyon to the green bench where Green Lake rests and to Vagabond. It does not take much climbing to pass the sign into the John Muir Wilderness officially. The trail actually looks quite familiar from snowshoeing on it the March before last. It looks like there must have been about 1.5 feet of snow then. I remember spotting blazes on the trees and being surprised that we were really on trail. 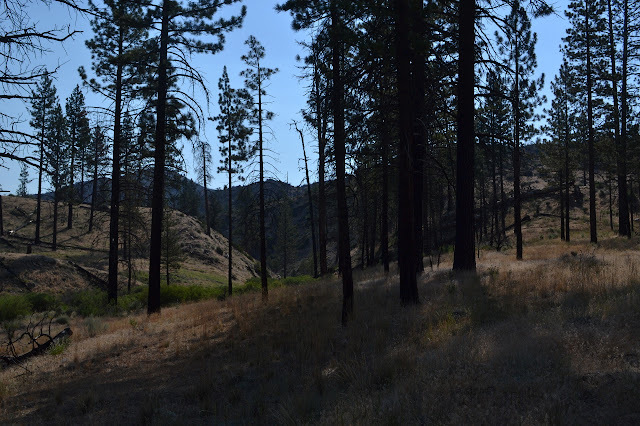 Now the trail is too obvious to notice the blazes, but it winds through the same trees and past the same rocks. We probably cut a switchback a little, but otherwise it seems the same route. The GPS even clocks the same 1.38 miles to the spot we turned around on that all too short hike. 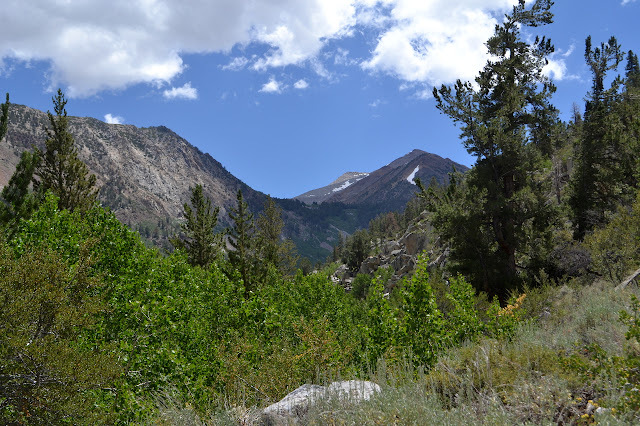 The view down the canyon of Bishop Creek. 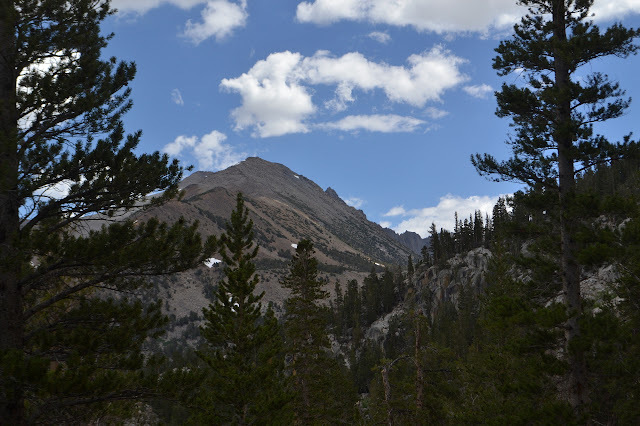 A peek at the tall peaks accessible up the south fork. As it turned out, quite a few others were also wanting to do San Guillermo Mountain after Lockwood Peak. There was supposed to be a vote on if we would, but we seem to have missed that step and just proceeded to Pine Springs Campground. The thermometer in the car says it is 89&def;F out there. I find that hard to believe. I could take that kind of heat when I lived in Pasadena, but I have gotten soft again with the luxury of a marine layer to keep things mild. A few take a moment to partake in the facilities only to find that they have been nailed shut with added "Keep Out" signs. I wonder what the excuse for that is since they did not seem unsafe last year. We step over the wire fencing meant to dissuade any wheeled vehicles from entering the Sespe Wilderness that surrounds the area and wander our way past bushes filling up with toilet paper. Really, there better be a good excuse for nailing the pits shut. Also, how much toilet paper visible does it take for people to realize that stuff is not going anywhere and needs to be packed out? It seems even the legged travel is not typically very far from the campground and the bushes clear up quickly. We drop into a rocky creek bed, where we lose the trail, and eventually climb back out to find it again. After that brief bit of down, we get to climbing. The view opens up quickly and is, to my mind, better than the one from Lockwood Peak already. My hand swings through empty space as I set up to take a photo of the long lump that is Lockwood Peak, the further slightly more rugged side being the high point. Thus is the discovery that I left my camera in the car. It seems I cannot notice the absence of two pounds of camera hanging around my neck unless I am thinking about it. A brief thought of going back for it flutters through my mind. We are not that far up yet, but I am with a group. That would be rather rude. I turn to climb some more. The realization that it really is hot seems to be coming to most of the group as we get high enough for nature to provide us with a wonderful cooling wind from the west. There are multiple noises of welcome directed toward and about that breeze as we climb the last bit before turning north along the ridge. The ridge comes with a second luxury: a shade tree. Someone has even cut away the lower branches so that more can comfortably partake. Below us, the badlands west of the mountain are revealed. We give the last folks up a minute or two to have some shade too, then make that turn to the north. This requires losing a little elevation. The north slope is occupied by the cheery purple flowers of the dreaded poodledog bush. This fire follower has not quite vanished again to wait for the next burn. There is enough room between them to pass without touching and risking the itch worse than poison oak. One last climb puts us on the top and experiencing a little better view. This is the better peak. If I had to forget my camera on one of these, it would have been better to do so on the other. It is still quite smoky. There is a spot in the far west where the grey seems to not just hide the landscape, but to replace it. The shapes of things look right to call this area Cachuma Lake. It even has a tooth shaped mountain just north, but the one I generally see near there should be well hidden by a taller mountain that is itself hidden by a taller mountain from this vantage point. We take a little time to try to take it in and then there is another call for a group photo even though it is the exact same group on the same day. It is not the same mountain! There is also a call for a couple packs to help stabilize the hiking stick monopod contraption as that wonderful breeze is still blowing. I kneeled in the front for both photos, but the sand is uncomfortably hot through my trousers only for this one. We head down again and back up carefully avoiding that poodledog, then take another stop under the shade tree for a while. Heading down finally, there is a brief movement toward the wrong ridge, which would probably just result in a wider circle to the campground, before the head of the line gets suspicious and we all move back to our original line for climbing. Now it feels too hot. That is probably the first time that climbing felt nice enough to the downhill feels like too much exertion will bring on heat stroke. Happily, it really is not that far. We try a slightly different route as we get down toward the rocky, dry creek bed. It does not end up saving us any movement over the rocks in the bottom, though. We climb up out on another trail that hops over a different section of cable near the cars and finish the hike. All seem to have weathered the heat well enough as we do. The car thermometer is reading 105°F as we leave and holds steadfast at that the whole way back to the main road. I realized that those peak baggers in the Hundred Peaks Section would be about as much in the neighborhood as they get as they headed for Lockwood Valley to bag Lockwood Peak. Honestly, it looks like an inconsequential bump to me. It is only on my radar because it is on the list, but I am perfectly capable of finding my own inconsequential bumps to climb. It is near a second listed inconsequential bump that should be on my radar because it is the basis for the name of the map quadrangle it occupies. The best guess for the weather seemed to be low or mid 80s, which is hot, but not quite too hot. The hike is short enough to deal with that. I decided to do it and the short hike up San Guillermo Mountain and sent an email off to the head leader, Bill Simpson, with somewhat less than my usual one week lead time. I got in and found out they would be doing an even shorter route that is more convenient to going up the second peak. We met at the end of Grade Valley Road and traveled just past the end of the pavement to the Pianobox Loop, then off the end to Yellow Jacket Trail. The start of an motorcycle trail marked "more difficult" is also our start for hiking. There is a gate to keep anyone wider out. We find ourselves facing off against an intermediate level motorcycle trail. The day is a bit into getting started and not particularly warm yet, but we all make sure there is plenty of water in our packs. The shade around here is not what it was before the Day Fire in 2006. It is starting to look like most of the standing dead trees have now fallen. We head down along the variously sandy or rocky track among the dried grasses. There are still a few bright flowers in the mix and only half of them are various types of buckwheat. Blackened by the fire, but still living. For the most part. I cannot pass up stopping by the big trees when we are so near and somehow Martha has never seen them. My original desire was to head up to the Garfield Grove, but the extra day for that is not working out after all. Considering how today is shaping up, it would have been a bit hot for the hike. My father seemed relieved to a surprising extreme to not have to find a different ride to the airport, so it works out for everyone to cut off a day of adventure. Instead of that remote grove that we might have all to ourselves, we head over to the paved and fenced Grant Grove, which we will have to share with tourists that arrive by the busload plus those in dozens of cars. 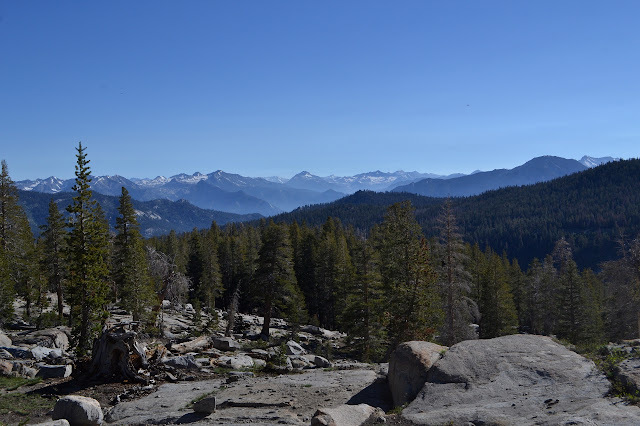 It was once part of the General Grant National Park, one of the first four national parks, but is now a part of the much younger Kings Canyon National Park. 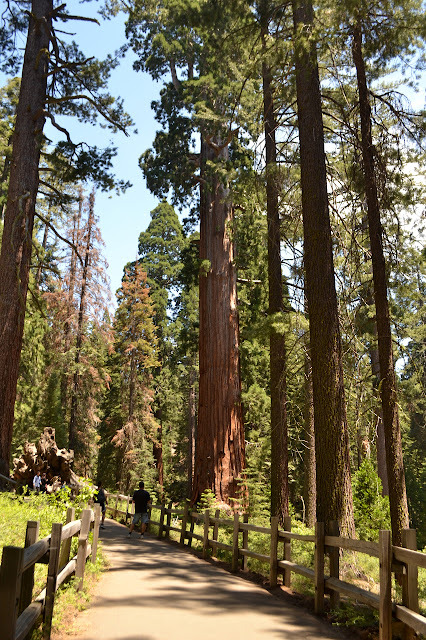 Importantly, it has sequoiadendron giganteum, and some of them are quite large ones. The grove has a paved walk past trees generally nearly 300 feet tall and one fallen log people can walk through and which housed some of the first white settlers. (Day 4 of 4) I am up at the first hint of light. It is easy to get up in such mild weather. Martha has not taken it as quite so mild, so I let her have the neoprene socks for the early morning foot soaking. I did mention I was overpacked. We collect ourselves together and head up the little bit of trail to the crossing to finally give it a try just as it gets light enough to see into the water. I feel like it got quieter about halfway through the night, but the water level really does not look any different. We drop down to the crossing with smooth running water consistently across a wide section and cross. It does not seem to pull much at my legs as I go. Somehow the snow melt is not even cold. Much ado about nothing. A bit of blur as the camera gathers enough light in the dawn. The trail crosses in the crescent below the broken log with much of the water funneled into one spot of fast and deep water. The higher log is a lot like our previous crossing, except uphill. The pool between might be a nice swimming hole. The next crossing is marked "Boulder Creek" with a sign on a tree, although it is very hard to read. 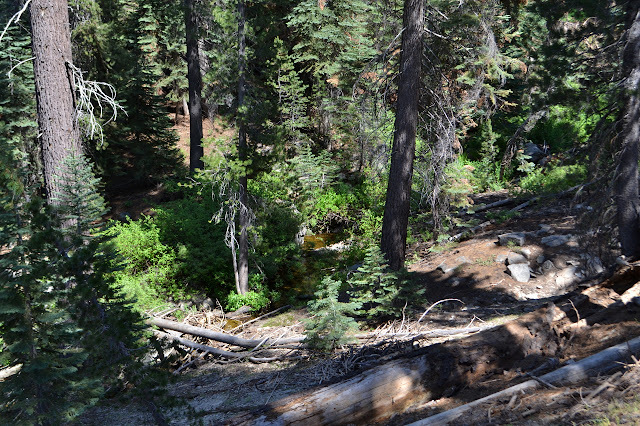 This is the outflow from Jennie Lake and we splash on through. The last crossing requires a little climb and then we can splash on through it too. I finally find the campsites I expected to see around the creek around it. Not such a bad spot. It should get some morning sun, unlike spots down in the canyon. We stop for a bit for breakfast and to allow the day to properly begin, not to mention to think about having dry socks again. Still dim as we come to the last of the big lines on the map to cross the real thing. (Day 3 of 4) It was another mild night, but the mosquitoes very nearly vanished early on into it. The sun comes quickly here and the morning golden hour is really quite something. I enjoy it with breakfast and happily the mosquitoes seem to be slow to wake up. Our northerly view from near camp: the morning sun as it hits Ball Dome. We head out to the trail again and wander gently downward, still high above the valley bottom. The air seems a lot clearer today and the snow on the far mountains is much more defined. (Day 2 of 4) The night was almost too mild and a few of the mosquitoes stuck around through it. Also, I am way overpacked for such mild nights. It is what the National Weather Service predicted and what the history of a fairly local weather station confirmed, but how could I believe that in the face of knowing there is still snow on the ground? It sits in great lumps all around me. The morning brings wakeful campers, but not a lot of noise except for the one excitable dog. 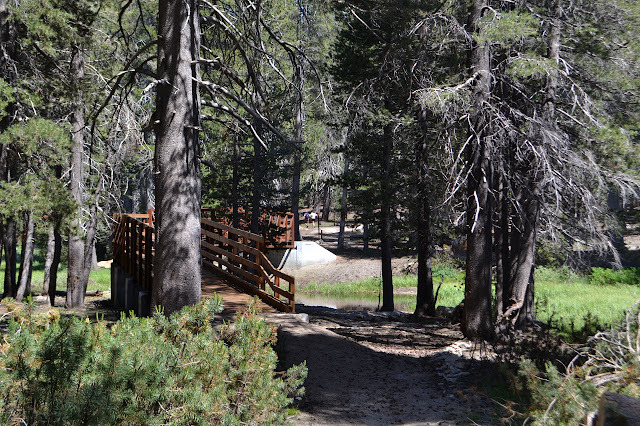 People seem to gather themselves up at a leisurely pace and wander away again, mostly turning back down the trail. It is the same with us, except that we are continuing out further. Jennie Lake has a nice rocky backdrop to the south. A few clearly do not yet want to get up. Far on the east side, I can see a hammock that is clearly still occupied, but that is the side to be on for the latest morning. A slab of ice slips from one of the rocks as we leave and it sounds just like rockfall as it goes. The crossing of the outlet at the trail looked rather soggy last night, so we head over at the first good crossing we see, grabbing a little water for the day on the way. 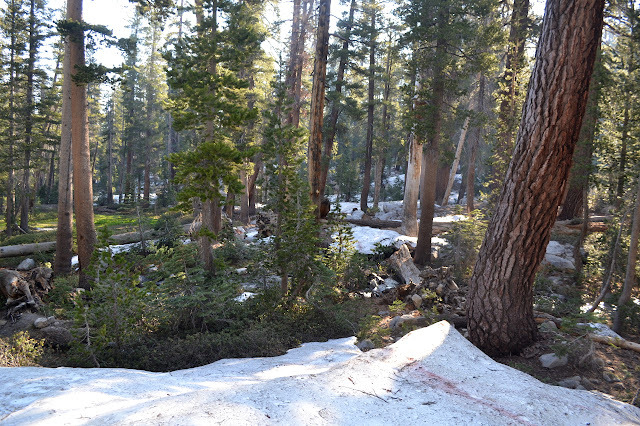 We were warned of snow on the trail above here, but that is not what makes it hard to find the trail on the other side. After the huge trail all the way up to the lake, I am not quite looking for the more normal faint track it has become and pass right over it the first time. A little better looking near a cairn shows the trail climbing through the woods on another meeting. Patchy snow through the woods. 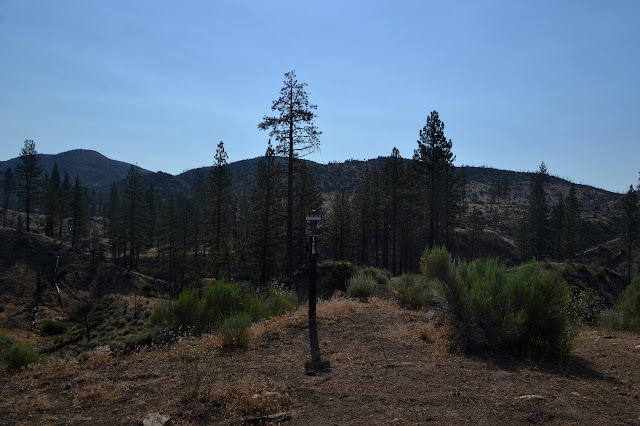 (Day 1 of 4) The Forest Service does not charge anyone to enter the Giant Sequoia National Monument, but we cannot get to Jennie Lakes without passing an entrance station for one of the National Parks and they want some money. Martha just flashed her pass which not only got us in free, it allowed us to use the shorter, faster line past the entrance station on this crazy holiday weekend. After finding a far parking space to wait in line to chat with a Park Ranger in Grant Grove Village, we are still an hour later than we wanted to be at the trailhead. 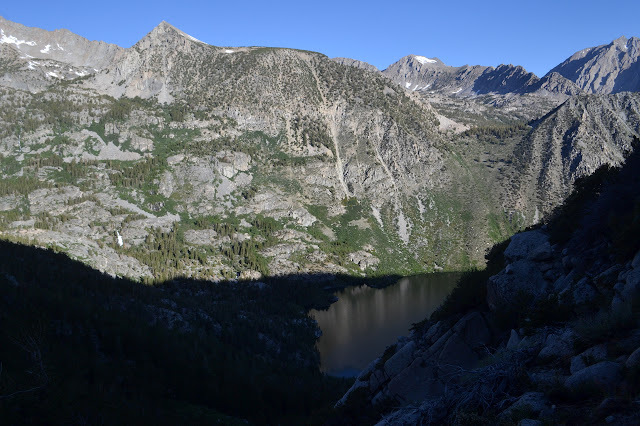 Permits to hike in Jennie Lakes Wilderness are self issue at the trailhead and that is enough to camp within the Monument and take day excursions into the two Parks, but camping in the Parks requires a different permit subject to quotas and fees. The only space left in the lot is the overflow parking and the box for signed permits is stuffed past capacity. The permits are surprisingly far down the trail, just after a big new bridge reeking of creosote, and there are still a few left for the next few folks along. The trail is abuzz with people, most of them day hikers. Somehow, they thin out a bit as we make our way up the trail. A little bit of water in Big Meadows Creek.